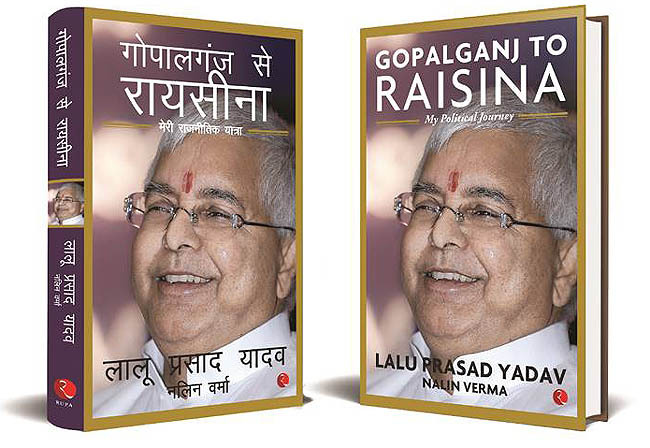 Following are excerpts from two chapters - ï¿½Highs in Delhi, Lows in Bihar and ï¿½The Rising Stars of Bihar Politics of ï¿½Gopalganj to Raisina: My Political Journey, a memoir by Lalu Prasad Yadav, President of the Rashtriya Janata Dal, a former Chief Minister of Bihar and former Railways Minister. It is published in English and Hindi by Rupa Publications and is priced at Rs 500. The excerpts are being carried with the permission of the publisher. I was determined to see the end of the BJP-led government at the Centre, because I believed that both Bihar and the rest of the country had suffered as a consequence of this party's rise. Central leaders, especially those belonging to Bihar, had been placing obstacle after obstacle in the smooth functioning of the state government under Rabri Devi. Nationally, there was a sense that the oppressed classes as well as the minorities were getting a raw deal. Besides, the BJP had become overconfident, and that had led to arrogance among many of its leaders. It was this mix of overconfidence and arrogance which led the BJP to launch the ï¿½India Shining' campaign. The party was under the illusion that its victory in the 2004 Lok Sabha polls was a mere formality, and that Vajpayee was certain to return to power. I was to play a crucial role in bringing the curtains down on the Vajpayee Government. It may be recalled that I had helmed a partnership between the RJD and the Congress. My popularity among the people of the state, the tireless efforts of my party workers, the work put in by my allies -- all combined to bear fruit. We pulled off a miraculous victory, winning 29 of the 40 Lok Sabha seats in truncated Bihar, after the creation of Jharkhand. The RJD alone secured 22 seats. Paswan's LJP and the Congress won four and three seats, respectively. The BJP and the Janata Dal (United) -- the Samata Party had merged with the JD(U) -- had to be content with just six and five seats, respectively. The poor show of the BJP-led alliance in Bihar contributed significantly to its overall low tally of seats nationwide, leading to its exit from power. I had not only kept the RJD flag flying high at a time when most observers thought that the Vajpayee-led BJP would triumph, but also facilitated the return of the Congress to power after a gap of eight years -- its last regime was that of P.V. Narasimha Rao's, whose tenure ended in 1996. Perhaps, even more than some Congress leaders, I was eager to make Sonia ji the country's next prime minister. Over the years, the RJD's bonds with the Congress had strengthened. At a time when a section of senior Congress leaders was opposed to her leadership, and partners were unsure of their continuance in the Congress camp, the RJD had emerged as the most credible ally of the Congress. The Congress-RJD partnership was -- and is -- based on a common ideology to promote secularism and save the idea of India, as enshrined in our Constitution. Months after taking over as Congress president, Sonia Gandhi had successfully contested the Rae Bareli Lok Sabha seat from Uttar Pradesh and debuted in Parliament. The constituency had sentimental value for her; it had been represented by her mother-in-law and former prime minister, Indira Gandhi. Thereafter, in 1999, Sonia Gandhi became the Leader of the Opposition in the Lok Sabha. She had criss-crossed the country, campaigning on the theme of aam aadmi (common man) to blunt the BJP's India Shining campaign. Despite her relative inexperience in electoral politics, she played a leading role in the Congress's comeback to power in 2004. I was the backbone of the ï¿½common man' drive; after all, it was this section of society, the aam aadmi, to whose upliftment I had devoted my political career. Sonia ji had surprised not just her opponents, but also many of those from within her party with the seasoned manner in which she led the Congress campaign, overcoming many hurdles along the way, including her ï¿½acceptability' and the language constraints. Obviously, she was best suited to replace Vajpayee as prime minister. Not surprisingly, the newly-elected Congress MPs unanimously elected her their leader and pitched for her to be the new prime minister. But Sonia ji, in a dramatic manner, refused to accept the mantle. There has been much speculation since then on why she let go of the opportunity. But whatever the reasons, she declined and suggested the name of Dr Manmohan Singh-a veteran economist with vast experience in governance-as her prime ministerial choice. The Congress MPs were deflated, and very reluctantly accepted Dr Singh's name. Readers will recall the dramatic scenes that were witnessed on the day when Sonia ji declined to become the prime minister. It is not that Congress leaders did not like Dr Singh. They had high regard for him, and they hadn't forgotten the time when he, as the country's finance minister in Rao's government, had turned around the economy, bringing it back from the brink of collapse. However, they had fought the elections under Sonia Gandhi's leadership and wanted her to lead the country. With my three children, Misa, Tej Pratap and Tejashwi, becoming active in politics, my opponents began to attack me for promoting what they called dynasty politics. These are baseless and uncalled-for allegations. As parents, we are supposed to help our children in pursuing their passion. Usually, children are influenced by the atmosphere they are born and brought up in. I don't find anything wrong with the progeny of lawyers, doctors, writers and professors adopting the vocation of their parents. Parents are, after all, duty-bound to help their children pursue the career of their choice. Rabri and I never interfered with Misa when she was doing her MBBS course. We didn't interfere with Tejashwi's passion for cricket. Tej Pratap is good at playing the flute, apart from working for the party. They are all adults, doing what they like. We, of course, supported and guided them when they showed an inclination towards politics. There are several instances in other parties, where leaders have promoted their children in politics. I find nothing wrong with it. I was a poor cowherd's son. I had not inherited politics from my family. I struggled hard to gain acceptance and recognition from the people. Some elections I won, others I lost. But I never cast aspersions on any of my political opponents for promoting their sons and daughters in politics, even when my children were young and not in politics. In fact, readers will recall, I joined student politics well before I was married to Rabri Devi. Misa was born when I was in jail in 1975. She was barely two years old when I was elected an MP from Chhapra in 1977. My other children were not born then. I don't believe in the petty politics of attacking my opponents simply because their sons and daughters are in politics. I don't care if someone attacks me, for I know that my children, after attaining adulthood, have chosen the vocation of their liking.